This music was created following a challenging trip in Iran during Easter of 2016. Just few days after return from Teheran I was sitting on the sofa and watching TV. It was night and I ended up in a documentary about the wars of Alexander the Great in Persia. The documentary described the travel of Alexander through places which I had visited few days earlier. It was night and I started to improvise a music matching the images on the TV screen and, in approximately one hour, the fundamental part of the melodies was created. The entire compositions was finalized during the following 3 weeks. The pictures of the video were taken during the Iran trip by my and my companions. This piano composition was created during the summer of 2015, mainly while I was spending some days of vacations with some friends of mine in their villa located in the north of Athens. During the hot days of the Greek August I profited of a grand piano and. thus, the left-motiv of the new composition emerged, while details were fixed one month later in Brussels. The title "Athina" is a contribution to the teen-daughter of my friends: while coming back from the summer camp, the poor innocent girl found her bedroom occupied by me and, like in the tale of Snow-White, she had to arrange temporarily somewherelse. I dedicated to her this composition to try to gain some benevolence. The pictures of the video clips have been taken by a professional of my country, Roberto, and show images of Castelluccio di Norcia, an amazing mountain region in central Italy. This music was composed between March and June 2013. The inspiration started during a snowing night in Brussels, after returning from a jazz concert in Leuven (that I liked a lot). In fact, I was inspired by some notes I heard during the performance. Then, it took some months to complete the entire piece. In the meanwhile, while trying to finalize the music, I was impressed by the news coming from Istanbul, namely because of the people protesting against the destruction of the Gezi Park, with the following brutal repression by the Turkish State security. The entire event let me think about how things evolve in life, and how everything is unpredictable at the end. The pictures of the videoclips were collected form around the Internet, especially from blogs, online newspapers, forum ecc. All rights about this music are reserved. A piano composition created during some nights in December 2012 and January 2013. It reflects a period of hard work, declining entertainment, and insomnia. This is one of my oldest piano compositions. The leit motiv was created probably in the late '80s in Recanati, the Italian village where I was living, however the final completion happened only in 1992, during my stay at the College of Europe in Bruges (Belgium). There was an old piano at one of the students residences and I finalized the music there. 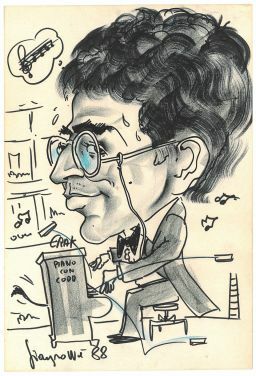 I played this piece at Italian national party organized with my Italian colleagues (in March 1992) and many of my friends there liked it a lot. This is the main reason why I continued to play this music in the following years and I did not forgot it (as it happened for most of them). The pictures of the video have been taken by my Turkish friend Irem Meder. This piano composition was made during a short staying in Alexandria, close to Washington DC. I was inspired by the amazing green in the residential areas, the picture sod my painter host, Beatrice, and the piroette of his daughter Teresa. The images of the videoclip reflect all of that. This is the instrumental version of a piano song which was intended to be completed later with lyrics. The melody was originally created while having in mind a personal affair, while the entire works with words was deemed for the singing talent of an Italian girl living in Brussels - however I never found time and concentration to write the text, thus the composition remained uncompleted. The title of the song is somehow linked to Swedish sweeties and desserts, some of which were available at my preferred coffee-bar in Brussels, the Blomqvist Expresso Coffee Bar, an amazing nordic café which was run for just one year by an adventurous Sicilian girl before she realized that her mission was the Commission. This is a piano composition of September 2011. It was created during a melancholy rainy evening in Brussels, with my mood also influenced by the news about the sudden departure of a friend of Recanati, Alfredo Campagnoli. It is one of my most sad composition indeed. The pictures of the videoclip have been taken by Alfredo himself during various excursions in caves and caverns in Italy between '70 and '90. His wife Paola kindly helped me to collect them. I uploaded this music for the first time in 2011 - this version is however shorter and slower, this is the way I like it. A piano blues improvisation whch became a final composition. This is one of my first piano compositions, and for sure the oldest of my previous repertoire which was not forgotten (for years I was not used to write down or record my creations, therefore most of them disappeared from my mind and memory). The let-motiv came in Genova, in 1985, at a family's wedding, then it was further elaborated in 1987 during a summer stay at the University of Marburg (Germany), where I was lazily attending German courses and discovering that there was an entire world out of Macerata and Recanati. It is a very simple melody, a bit Kleidermann-style. The composition remained uncompleted for years; then, in Summer 2011, I added the secondary refrain and some decorative complexities. This music reminds me a story about a Persian cat in Germany, and only the Persian cat knows what I am talking about. I created this music while watching my garden in Brussels in November, during the incoming Autumn. A butterfly showed up, just for a few seconds, while I was experimenting the initial notes of the music, and then the entire composition materialized quickly. The pictures of the videoclip have been taken in Italy by Raffaele Mosca. The inspiration for this music came in the last days of July of 2011, while coming back from Patinoire, a place in Brussels where expats Italians are used to meet for aperitivo, chatting and dancing. The leit motiv of the composition emerged during the night, however it took some months to get up to the complete version. The intermediate part of the music came while playing an untuned piano in my home village, Recanati, in the Marche region. The piece was then completed in late November. A good friend of mine told me that this is a tormenting, heartbreaking music. I would say that it is just my way to react when things do not go properly. Let's live with the perturbation, also musically, and then let's go ahead. A piano composition created in 2012 in the occasion of Christmas. A piano composition created in May 2012, after a day spent at the RoyalGreenhouse in Laken. It took a very few days to complete it. Currently, I find this music to be the most relaxing of my compositions. This composition was inspired by a couple of notes I heard when watching the movie "the Leopard" of Luchino Visconti in February 2012. because of this, I named the music with the temporary name "The Leopard", then I asked some friends for title suggestions, however nobody replied with interesting ideas. Thus, the temporary title became the final one. After some time, I watched the movie again, however I was not able to recognise the scene with the inspiring notes. Fact is, for me it is not unusual to get inspiration from a few notes giving rise to a fully autonomous composition, with the result that the the final outcome appears completely different from the inspiring notes. The pictures of the videoclip refer to a trip in Brazil in 2009. The place is Maranhao, Parque dos Lençois. This is a very emotional composition, which came through a sudden inspiration during a night in December 2011. Truly speaking, some parts of the music have already emerged sporadically few months before, but without a clear musical meaning. Then, during that night, everything suddendly became clear. I am very affectioned about this piano composition because it is one of my first attempts of modern piano music (with respect to my traditional style, a bit classic). The pictures of the videoclip have been taken by Lucia Giannini during a voyage in Vietnam and Cambodia.